Bob Denver worked as a mailman and school teacher prior to landing his first professional acting job, as Maynard G. Krebs on The Many Loves of Dobie Gillis with Dwayne Hickman and Warren Beatty. Many of Krebs' "beatnik" mannerisms were improvised by Denver, since neither the show's straight-laced writing staff nor Denver himself knew much about the beatnik movement. Four episodes into the run of Dobie Gillis, Denver was drafted. His Krebs character was replaced by his fictional cousin, Michael Pollard, but only for two episodes, until Denver successfully flunked his physical. Dobie Gillis ended in 1963, and the next year Denver was back as the dopey but lovable first mate of the marooned Minnow on Gilligan's Island, the "little buddy" serving under Alan Hale, Jr. and accidentally preventing countless rescues for the castaways. It was reportedly Denver who suggested reworking the theme song so the actors playing "the Professor and Mary Ann" wouldn't feel left out. Gilligan's Island ran only three seasons, but in reruns it became a staple. 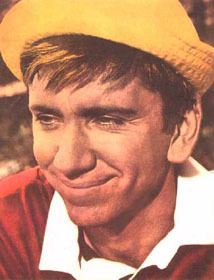 Denver reprised his Gilligan character in two cartoon series, one a recreation of Gilligan's Island and the other Gilligan's Planet, a science fiction reworking of the same silly concept. Since Gilligan's Island, Denver has played the lead in Woody Allen's Play It Again Sam on Broadway, done years of touring theater and dinner theater, occasional Gilligan and Dobie reunion shows, and reprised Gilligan on an episode of Baywatch. In 1998, Denver was arrested when he signed for a FedEx delivery of 30 grams of marijuana. Police spent more than two hours making a mess of his house, and reportedly confiscated two marijuana pipes and several more grams of pot. Reports at the time suggested that Denver's Gilligan co-star Dawn Wells had arranged the shipment, that his checkbook included several suspicious payments to Wells, and that prosecutors were pressuring him to name Wells as his supplier. Instead, Denver testified that "some crazy fan must have sent it." His punishment was six months probation. After retirement Denver lived in a remote part of West Virginia, where he hosted a syndicated radio show with his wife, Weekend with Denver and Denver. Fellow castaway Wells was the show's "castaway correspondent", and phoned in weekly reports. Denver died in 2005 at Wake Forest University Baptist Hospital in Winston-Salem, North Carolina.